How do expert Indian law advocates develop litigation strategy? 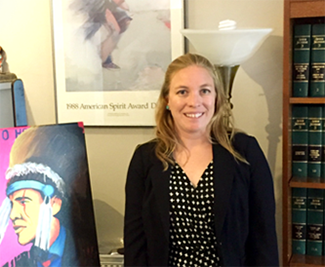 That’s what 3L Megan Horning learned this summer when she clerked for the Native American Rights Fund (NARF). related to an Indian land claim. “Because it was such a high-level case, it was an exciting time in the office,” Horning said. She also learned about the process of filing a document with the Supreme Court and about how NARF attorneys have honed in on creating documents tailored to the needs of the Court. Horning says the biggest project she worked on was assisting in the preparation of a report on the work of NARF’s Tribal Supreme Court Project. NARF and the National Congress of American Indians established the Tribal Supreme Court Project in 2001 in response to losses for tribal interests at the Supreme Court. Since then, the Tribal Supreme Court Project has monitored all Indian law questions approaching the Supreme Court. One of her favorite experiences with NARF was when she assisted with a voting rights meeting on how to protect Native American voters from discriminatory election practices. “I loved being able to learn about the range of voter discrimination happening in Native communities across the U.S. and how strategy could be developed to end it,” Horning says. Horning suggests that law students who seek an internship at NARF or a similar office prepare an Indian law related writing sample in the summer after their 1L year and fully participate in their Legal Research courses.